Acne sometimes feels like a double punishment - first you have to deal with acne pimples and then with the scars that they leave behind. 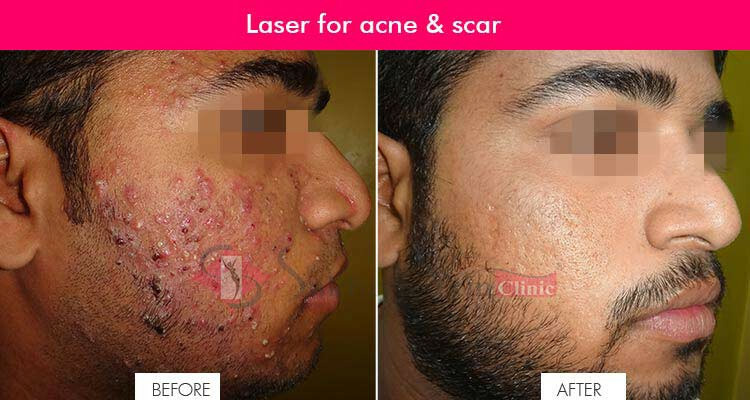 Laser for acne and scars seems to be an ideal solution. Acne is a skin problem that is usually caused during the teenage years due to hormonal changes among other factors. It may leave behind scars of the pimples, which are visible in the form of damaged skin, dark spots, reddish patches and zits. Laser acne scar removal has been a successful procedure in the recent times to tackle the problem of acne scars. In this process, the upper layer of the skin is burnt with the emission of laser rays. When the new skin comes up then the scars are either fully eliminated or they simply fade away. Different kinds of laser rays are used for different kinds of acne. Usually, carbon dioxide laser rays are used and they are generally found to be suitable for a majority of the skin types. Laser acne scar removal works the best on the scars that are not too deep. 80% of such scars usually get eliminated after 4-6 sittings of the laser treatment. However, it is important to understand that the acne scar treatment is not an instant solution. At least 2 weeks are required to ensure that the reddishness caused due to laser rays is completely gone. Some people may experience temporary change in their skin colour too. It takes at least 18 months to experience optimum results of this treatment. The good news is that the treatment does not leave any severe impact on the skin in most of the cases. There is no news so far about it causing any kind of infection or anything. Deep scars on the skin can also be treated either during or after the laser treatment. Very rarely some cases of permanent skin discolouration has been reported. But, it is very rare! Usually, the treated skin changes its colour but only for a little while. This also gets rectified over a period of time. Laser treatment for acne scars is extremely effective and safe. In the rarest of rare cases if the treatment does not work well, then also there are no adverse effects of the treatment that are left behind. CAN I COMPLETELY OVERCOME ACNE? Yes!! Any type of acne [pimples] is curable. PLEASE SUGGEST ME WITH A SUITABLE TREATMENT FOR ACNE SCARS? Fractional CO2 laser is an FDA approved treatment, which removes acne scars without damaging the skin. We apply topical anesthesia cream pre-procedure to reduce redness & any kind of discomfort. TO WHAT EXTENT SCARS CAN BE CLEARED? It depends on the type, depth, duration of the scars. Multiple sessions [6-10 sessions] are required for 4 weeks apart. 50-80% can be cleared easily. The more the number of sessions the better the results. HOW LASER WORKS ON SCARS? The laser triggers the body’s natural healing process by instigating the production of collagen & new healing skin cells, thus healing the scars. WHAT IS POST LASER EFFECT ON THE SKIN? There can be redness, swelling and dry skin that can be experienced after the laser. It fades off in 5 days. But, it is advised to take proper care of the treated area. Apply sunscreen above SPF 30, avoid direct sun exposure and apply ice for 2- 3 days which reduces swelling & redness. Continue medications as prescribed by the doctor. CAN LASER BE COMBINED WITH OTHER TREATMENTS FOR BETTER RESULTS? Definitely Yes! For active acne, we combine laser with chemical peeling and microdermabrasion. Please look for chemical peeling FAQs. We can also inject fillers designed for acne scars combined with fractional laser for faster results. Please see filler FAQs for more details. I HAVE MANY BIG PIMPLES. PLEASE SUGGEST ME SOME TREATMENT OPTIONS? Acne can be treated by laser combined with chemical peeling. Light therapy like IPL can effectively treat acne. Fractional Co2 laser reduces the pore size & scars. Long pulse Q-switch can also effectively target active acne. Chemical peeling can decrease sebum production & reduce pigmentation. Combination of all treatments works best in acne for achieving optimum results.